Are you a local teen artist? Submit a design to our Teen Summer Reading Artwork Contest. 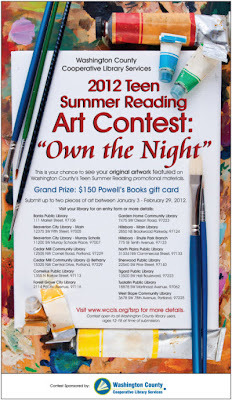 The winning design will be used on all 2012 Teen Summer Reading program materials across Washington Co., including posters, bookmarks, flyers and more! The winner also receives a $150 gift certificate from Powell's Books. See this page (PDF) for all of the contest details and the official entry form.